Young women are pioneering the start-up/social entrepreneurship scene all over the middle east, often in areas in or recovering from violent conflict. Their unique position affords opportunities for economic recovery and social reconciliation. Women are leading the rapid growth of social entrepreneurship in the middle east, often in areas in, or recovering from, violent conflict. Cooperation amongst entrepreneurs is creating unique opportunities for economic growth, community building, and reconciliation. Young women are exploring new value chains and expanding market niches. In fact, according to the Women’s Entrepreneurship Report, women entrepreneurs in MENA are 60% more likely than their male counterparts to offer innovative solutions, and about 30% have international reach – again, exceeding male-led enterprises. By participating in business development programs, micro-entrepreneurs broadened their market base and increased profits by developing relationships among themselves and with other business actors, government authorities, and customers in other parts of the country. They create relationships/networks across ethnic lines, thereby contributing to social reconciliation. “Millennials Welcome! Young women are revolutionizing the startup scene despite conflicts in MENA”. By Tobias Lechtenfeld for The World Bank. March 26, 2018. 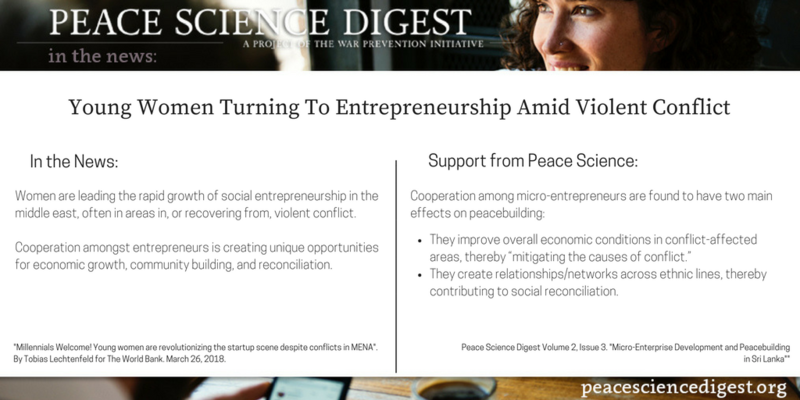 Peace Science Digest Volume 2, Issue 3. “Micro-Enterprise Development and Peacebuilding in Sri Lanka“.